CASE FORMING The Right Way. These pictures are all provide by John Delozier(JD) who has begun to do some of my case forming for me. I have formed a number of different .17 cases using the standard Double end forming die from BULLBERRY, and they all have turned out fine. I must say that they dont look as good as the ones that I have received from JD who is using the Redding or RCBS forming dies. I have found enjoyment in learning the process of case forming, but I am not sure that I could convince myself that I like doing it. I may just be bitter, because I formed over 150 .17 Jet cases last night. I have found that it is important to anneal these cases to achieve top accuracy and ensure adequate case life. It is less important on some cases like the Mach IV, but I still choose to anneal. 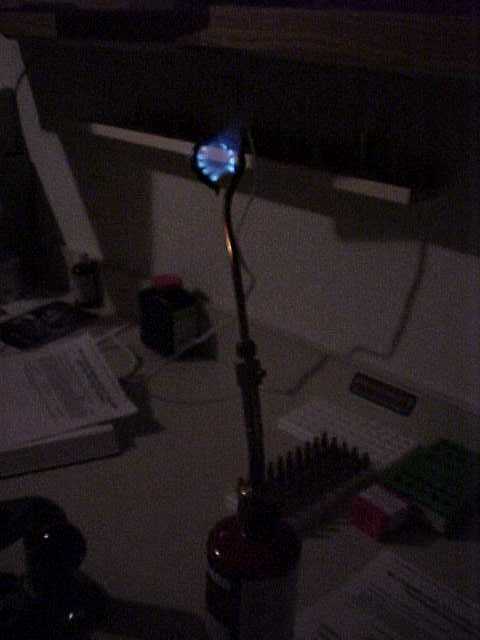 I have purchased a Series 2 Annealing tip from the Woodchuck Den that I use to anneal the cases once I have formed them. The phone number for the Woodchuck Den is in my Links section of the page. I have included a picture of this tool below. I place the cases in a baking pan with " of water. I anneal each case individually and nock over with the annealing tip into the water to quench. With the annealing tip came instructions to anneal each case for approximately 15 seconds. I have had a little better luck with close to 20 seconds, but the key is to not over heat the brass. I have found that the annealing tip makes this task rather easy, and now I dont regret annealing like I used to. When annealing the cases, you want to hold the flames at the area that is to be stretched during the fireforming and then upwards to the neck. You do not want to heat the brass until it gets red, you just want to heat until the case begins to discolor to a blue/green color a little. Overheating can ruin the brass. Another thing to remember when loading cases for the first time. Load up a few at a conservative to moderate level and shoot. You can then determine if the load will form the cases to your satisfaction before you load them all. If you load them too hot, you may destroy some of the cases by splitting the necks. 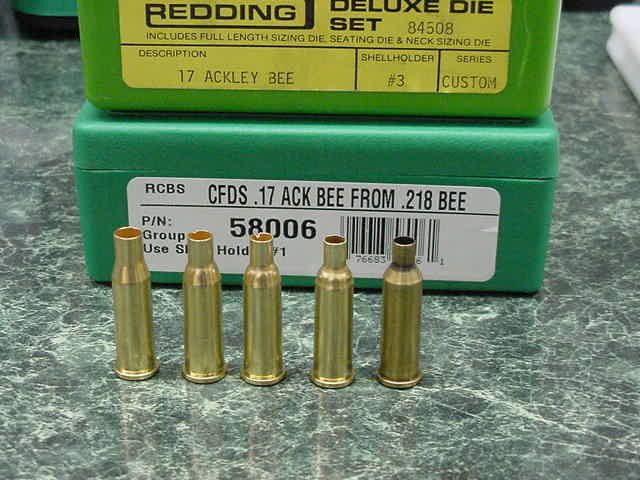 For the .17s, I like to use a 25 grain bullet for fireforming loads. The heavier weight seems to form the cases a little better. I have had some incredible groups while fireforming, so dont feel like you are just wasting bullets. Load up a bunch of fireforming loads, sight in your gun and go hunting or shooting. My .17 Hebee averaged .5" while fireforming. 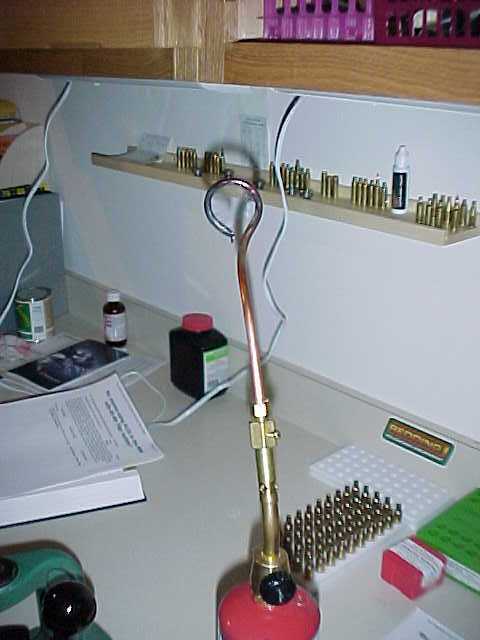 The velocity was a little lower than standard loads at 3250 fps with the fireforming load (25 grain bullets). There are pictures of my .17 Hebee case forming steps in the Hebee article on my page, so I have not included them here. I will add a photo of the case forming on the .17 Jet when I have a chance. Check out the pictures below to see what the case forming involves. I have also attached a price list from JD and contact information if you would like for him to form some cases for you. Shown above is a picture of the transformation of .218 Bee case to a formed .17 Ackley Bee case that has been fireformed. 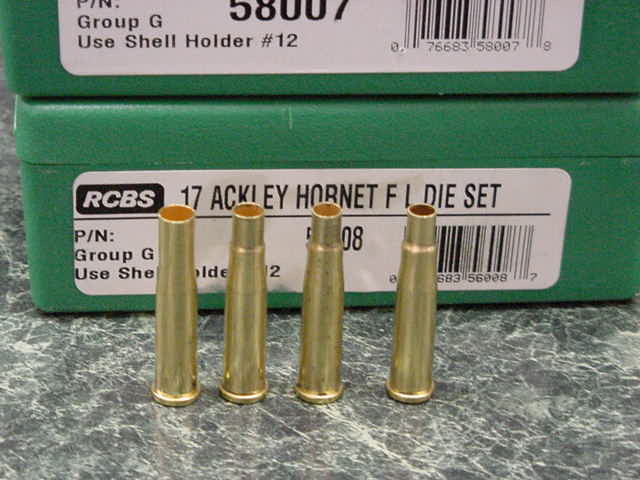 Here are the .17 Ackley hornet case forming steps. Here the transformation is showing the results from each forming step. The fireformed case is not shown, but will be a straight wall case with sharp shoulder angle. The Mach IV case doesnt have to transform nearly as much as the previous cases mentioned. The forming steps make the case look like the real thing even before fireforming in the chamber. The shoulder angle is not changed and the location of the shoulder is preserved so that the case looks great from the start. The same number of steps are required to form these cases. Other small calibers will be added in the future if enough demand is shown. Availability may be limited on some cases based on supply of brass. All prices include shipping via US Priority Mail and a plastic cartridge box.